Documenting my journey from Moscow to Vladivostok on the Trans-Siberian Express, July 25 - August 11, 2008. Every day of the trip brought something special, but I think that this day was probably the most special of all. It started with a tour of Novosibirsk, a big, thriving city. Its main claim to fame is that it has the largest theater house in all of Russia, even bigger than the Bolshoi in Moscow. We drove by the theater on the way to the town's WWII memorial. The memorial was very powerful; I thought it was the most moving of several we visited. At the memorial, we saw several wedding parties being photographed, and from then on we ran into brides and grooms everywhere we went. One of the women in our group became the official "bride spotter;" as we'd drive through towns she'd suddenly shout "bride on the left!" I guess it is a tradition to visit memorials and historic places on the day of your wedding. And weddings often take place on Fridays so that the celebration can last the whole weekend. As we drove through the cities, the guides always pointed out the apartments that Stalin built and the ones that Kruschev built. Stalin's are considered better than Kruschev's, though to me they all looked the same: plain and gray cement blocks with small windows! We had lunch in a very interesting place: Akademgorodok. It is a city of scientists, started by Kruschev. People thought it was a crazy idea, to build a scientific town in the middle of Siberia, but scientists flocked here because they were allowed complete academic freedom. The town is built within a forest, just a lovely setting and sometimes referred to as "Silicon Forest." Before the collapse of the Soviet Union it was a high-security area that few could enter, but now it is completely open. Our lunch was in the "House of Scientists and Scholars," which is like their faculty club. We made a stop at a railway museum on the way to our eclipse viewing spot on the Ob River. We were on a specially reserved beach for people traveling with MIR. (We heard there were 20,000 people who had come to town to view the eclipse, though thankfully they weren't trying to share our beach!) It was cloudy when we arrived and we were all worried for our friends, the eclipse chasers. What if the clouds obscured the eclipse that they had come all this way to see? We arrived 2 hours before the eclipse started, and 3 hours before "totality." The time flew by--it was nice to be in the fresh air, which was filled with anticipation. The serious eclipse chasers set up special telescopes and cameras. As the minutes passed, so did the clouds--they cleared just in the nick of time. We all had special glasses that allowed you to look directly at the sun, so we could see from the moment of "first contact"--the moon overlapping the sun--to "totality," when the sun was completely obscured. 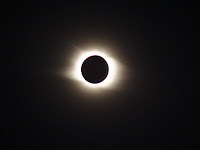 "Totality" lasted a little over 2 minutes, and during that time you could look at the sun with your naked eye. At totality, the temperature dropped and it got dark enough to see some stars; Mercury and Venus both shone brightly. Though it didn't exactly change my life, the experience was certainly hard to find words for: Magical? Mesmerizing? Awe-inspiring? They don't quite do it justice. Put it this way, if I had the chance to see another one, I'd go in a second.